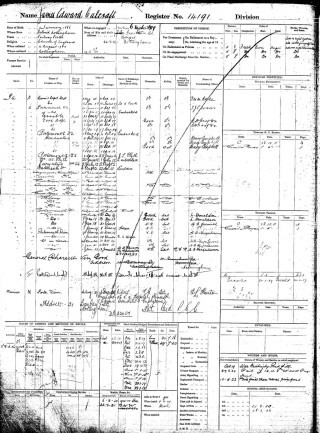 James Edward Calcraft service record sheet. 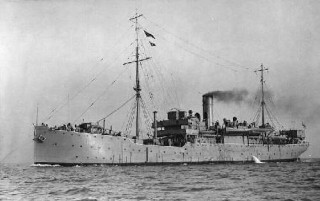 HMS Glory between 1910 and 1915. George Grantham Bain collection at the Library of Congress: made available by Wikipedia. James Calcraft’s is the first name to appear on the list of servicemen that was found behind the organ at St Mary’s in 1995 by the Rector of Bottesford, Reverend Geoffrey Spencer. On the church organ list, his name is followed by the names Alfred Calcraft and Charles Calcraft. In the 1891 Census, James E Calcraft was recorded as one of the three sons of George and Elizabeth Calcraft who lived at 4, Spalton’s Row (now known as Wyggeston Cottages), Bottesford. George senior was a 34 year old ironstone labourer born in Muston, his 25 year old wife Elizabeth was from Bottesford itself. James, born in 1886, was their second son, preceded by his brother George A (b.1882) and followed by Charles W (b.1888) and sister Sarah (b.1891). The family had moved more than once, George junior having been born at Eastwood, James and Charles at Netherfield, Sarah at Bottesford. The ‘E’ in James E Calcraft’s name stands for Edward. The initial has been given as a ‘G’ in some records, probably because the hand writing in the census is a little unclear, but there is no doubt that ‘E’ is correct. In the Bottesford Census return for 1901, there are two men named James Calcraft. However, one is James D.S. Calcraft, aged 1, born in South Wales, who with his brother Thomas, aged 3, born in Hammersmith, lived with parents William and Mary Calcraft, born in Yorkshire and Lancashire respectively, at 27 High Street. The other is James Calcraft, aged 15 (born 1886 at Colwick), who was working as a farm labourer at Singleton’s Farm, Chapel Street. The location names Colwick and Netherfield could easily refer to the same area in the south-easterly suburbs of Nottingham, and so the this latter James appears to be the son of George and Elizabeth Calcraft, who with children Charles and Sarah, still live at 4, Spalton’s Row. In addition, an elderly couple named William and Mary Calcraft, probably George’s parents, live next door at 2, Spalton’s Row. James and George junior have evidently left home. George junior is not identified in Bottesford in the 1901 census. The General Register of Births, Marriages and Deaths (the ‘BMD’) tells us that James Edward Calcraft, born in 1886, married Lottie Wayman in Nottingham during 1919, and that he died in 1949, again in Nottingham, aged 63. His brother George Alfred Calcraft joined the navy in 1899 and served for sixteen years. 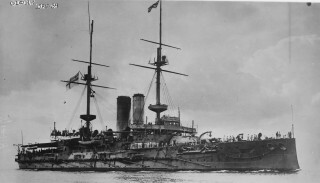 He lost his life when his ship the HMS Princess Irene exploded in the Medway off Sheerness on the 25th May, 1915. He was 33 years old. His other brother, Charles W. Calcraft, served with the Royal Engineers in WW1, and died in 1963 in Melton Mowbray aged 75. His name appears in the Bottesford Methodist Chapel 1st World War Roll of Honour. James Edward Calcraft enlisted on the 8th August, 1905, when he was 19 years old, having previously worked as a railway porter as well as a farm labourer. He joined the Royal Marines, and served as Private PO/14191, Royal Marines Light Infantry, Portsmouth. On his Attestation papers he gave his next of kin as his father, George Calcraft, Grantham Road, Bottesford. 12/4/1914 to 10/4/1916 HMS Glory, a Canopus class battleship which saw action in the Dardanelles in 1915. 27/7/1916 to 8/12/1919 RFA Lucia, a submarine depot ship which had been converted in 1916 from the former Spreewald, a captured Hamburg-America Liner. The Spreewald was launched in 1907 at the yard of Furness Withy & Co at West Hartlepool, and remained in service until she was broken up in 1951. The Royal Marines Medals Roll (located with FMP), issued at RM Deal, records that James Calcraft, Pte Po.14191, was awarded the Star (probably the 1914-15 Star), Allied Victory Medal, British War medals. 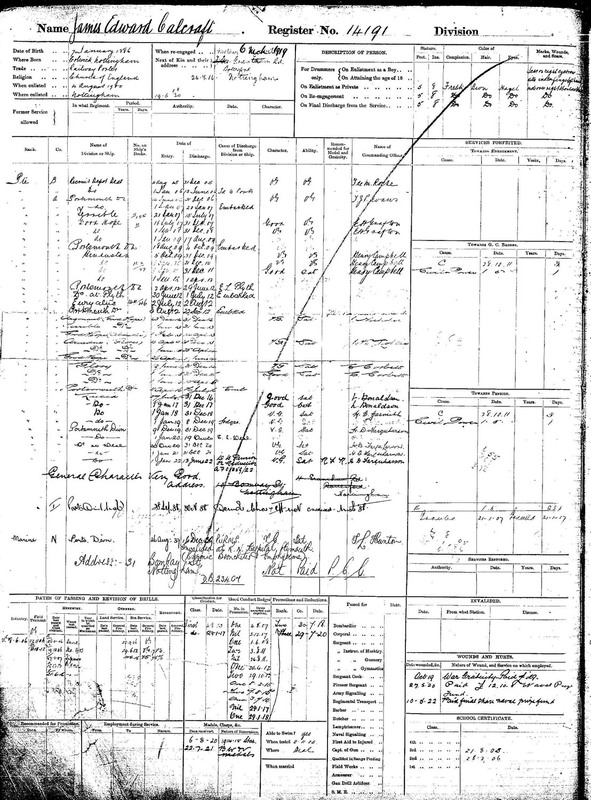 The online search also provided his service record sheet covering the period 1899 to 1919, as shown in the first illustration in this post. His home address as indicated on his 1919 service record was 10, Bombay St, Nottingham. However, the Electoral Register from autumn, 1922, has him (James Edward Calcraft) as well as brother Charles William and their parents, George and Elizabeth Calcraft, still at Wyggeston Terrace, Bottesford. His wife is not on the electoral roll, but the reason for this is uncertain. Later Registers indicate that by 1927 he was on the Register for Manvers Polling Station in the Nottingham East constituency. He apparently returned to the marines, perhaps as a reservist. He was in this late phase of service from 28/9/1938 to 30/11/1938, and from 26/5/1939 to 16/12/1939 he was in the “Porto Division” (probably referring to Porto, the port city in Portugal) until he was invalided at RN Hospital, Portsmouth, with “chronic bronchitis and emphysema”. He was finally invalided out in 1939, after 34 years. Brother of George Alfred Calcraft (Able Bodied Seaman, Royal Navy) who died in 1915 when his ship the Princess Irene exploded off Sheerness, and Charles William Calcraft (Royal Engineers) who died in 1953 at Melton Mowbray, aged 75. Charles William Calcraft died in 1963 in Bottesford, maybe registered in Melton Mowbray.